One thing I can say with utmost certainty is the memorable meal is not only about the food. Undoubtedly, the food must be unique and special. Does it need to be “Three star Michelin” special? Probably not. So what exactly are the elusive elements of the memorable meal? Price is not relevant; a big check certainly does not guarantee a wonderful experience! Atmosphere is crucial, service is key, the food, the location, even the weather all are essential factors. A friend recently shared a story of a particularly romantic lunch at what I had always considered to be an average restaurant located right down the street. 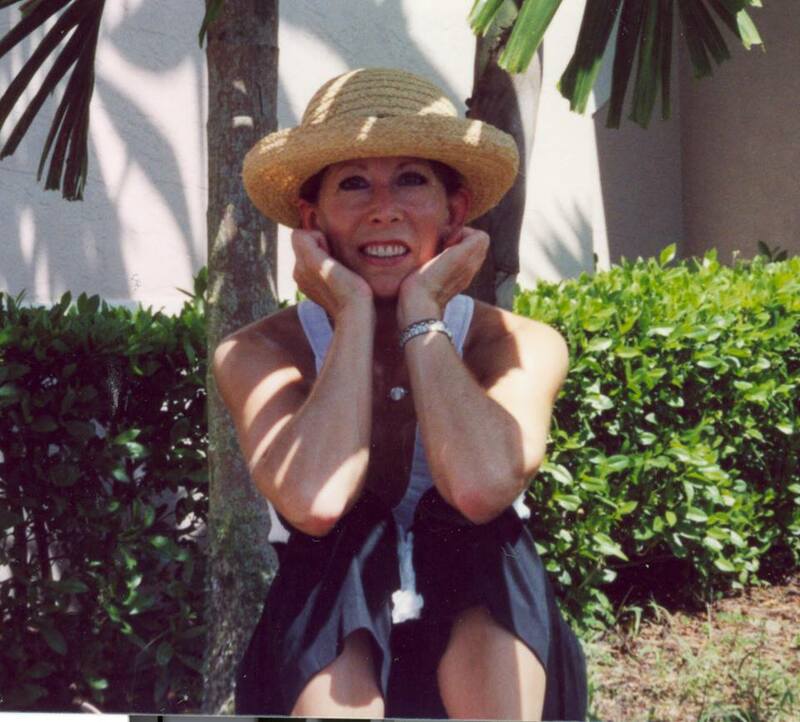 What made the lunch so special was the fact that a hard rain, common to South Florida, began to fall and as my friend and her husband were seated outside at an enviable table with a view of the intracoastal they were loath to flee for cover with the other diners, instead opting to huddle under an overhang. They ignored the monsoon and continued to enjoy their food and the view, feeling as if they were on some exotic adventure! Regardless of how idyllic one might consider such a dining episode, it might not perfectly fit the picture . . . or palate of another. Timing and situation are important scenarios to consider. A special first date can make for a wonderful memory no matter that the food was mediocre. The same might apply for beautiful weather, a happy occurrence such as a wedding shower, or lunch with “the girls”. Dinner with the man or woman of your dreams, perhaps even a future spouse might also create the perfect tableau while the bland business lunch occasion would be hard pressed to elicit much emotion, no matter how magnificent the food or breathtaking the view! The elements of this phenomenon and the resulting outcome can only be defined as metaphysical dining; a mealtime situation that occasionally occurs when the pieces of this intricate puzzle fall into place a certain way on a certain day ultimately creating a metaphysical gastronomic event. 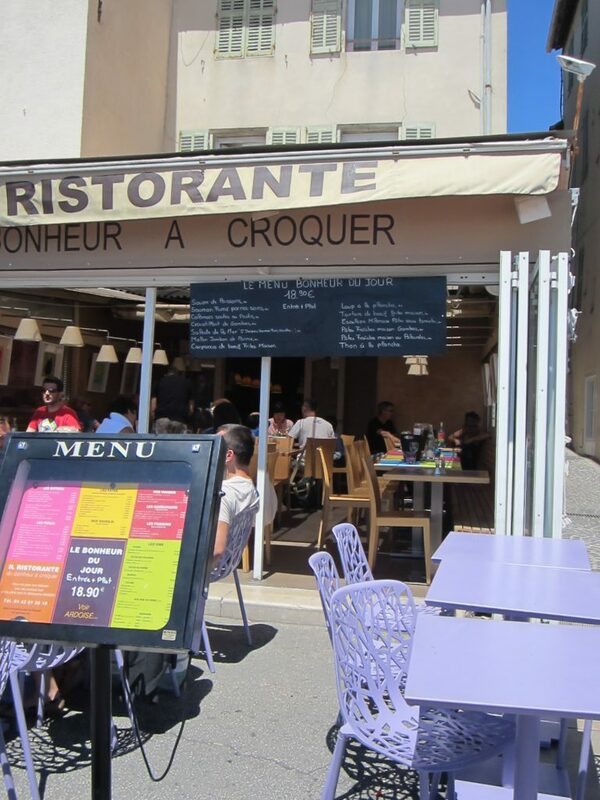 I was feeling that metaphysical vibe when my family and I wandered into Il Ristorante du Bonheur a Croquer in Cassis, France while on a recent trip to Europe. All of the puzzle pieces clicked together almost audibly and I sighed with pleasure the moment I was seated at table. I knew before the food even arrived that, years from now, I would remember every detail of that lunch and that simply by closing my eyes I would be transported back to the wharf location with the view of the boats and the blue Mediterranean shining in the sun. The entrance to the restaurant, was open and inviting; the sort where multiple hinged doors create a wall that may be completely folded back in order to invite the outdoors in. As we approached, the mistral swiftly made an appearance and I gripped my hat as the wind threatened to send it sailing into the water. Il Ristorante du Bonheur a Croquer, which I think roughly translated means the “The restaurant of the happy crunch” provided my most recent memorable meal. For those of you who speak French, by all means please post your corrections to my elementary French but be advised that I am so enamored of the “happy crunch” definition that a more pedestrian translation could permanently devastate my memory! We chose to eat inside rather than at one of the tables located wharf side, cozily tucked just around the “folded” wall which still permitted a view of the sparkling Mediterranean but protected us from the mistral, a cold, dry, strong wind common to the Provençal region. Lunch that day wasn’t only about the food, not that it ever is. 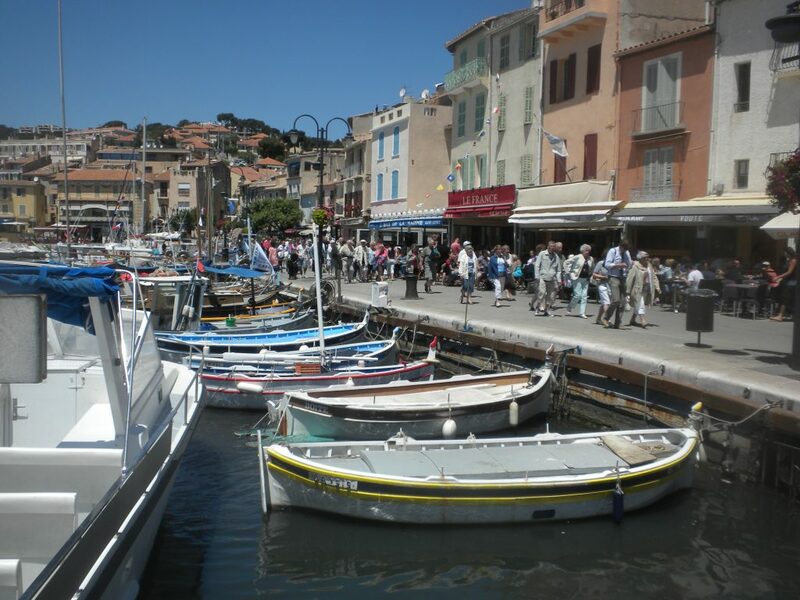 The weather, the colors of the linens, the simple and fun design of the menu, the gently slap-slap sound the boat hulls made against the water and the warm, familiar company of my family all contributed to “un délicieux déjeuner”. Everyone chattered away seemingly at once, trying to decide between sparkling or flat water and vin rose or vin blanc but I was too busy with my menu to notice. I have always had an interesting relationship with menus. Just a glimpse of an alluring selection of appetizers, starters, antipasti, hor’s d’ouevres, une entrée or canapé and I am “hooked” just as surely as if I was reading a New York Times bestseller! The beverage selections arrived post-haste closely followed by our lunch choices. Our young and pretty server was particularly kind to us and regardless of the fact that she spoke very little English was the picture of patience coupled with a great sense of humor; thank goodness as our attempts at speaking French were challenging, I’m sure! Just as we settled in with our food, Monsieur Mistral displayed some temper and sent two wine glasses and a carafe crashing to the pavement from an outside table as if outraged he hadn’t been invited in for a glass of fragrant local vin rose. Fascinated, we watched as after the initial startled reflex, no one made a fuss or could even be bothered to fetch a waste bin for the mess as the table in question was unoccupied at the time. Instead, everyone continued serenely with their meal, too focused on the food and each other’s company to lose any time being concerned. 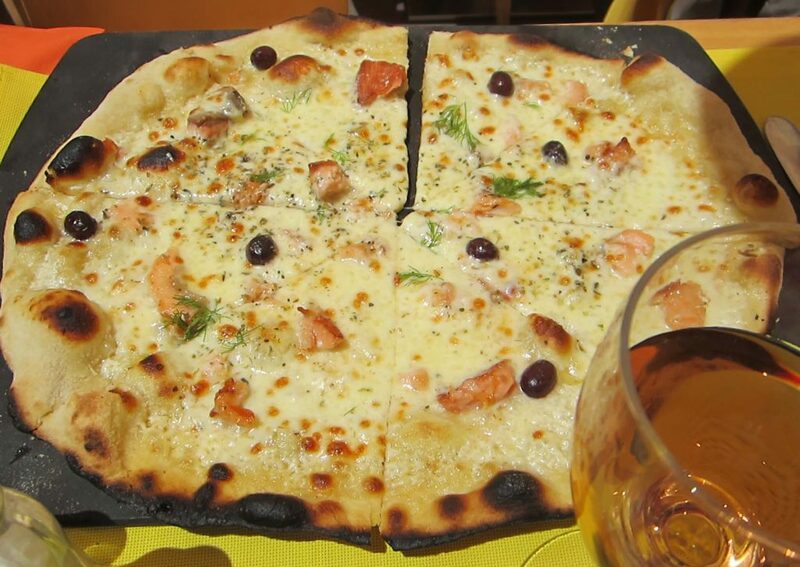 I was happy to take my cue from my fellow diners and turned my attention to my lovely grilled calamari and salmon and olive pizza with just a hint of béchamel. 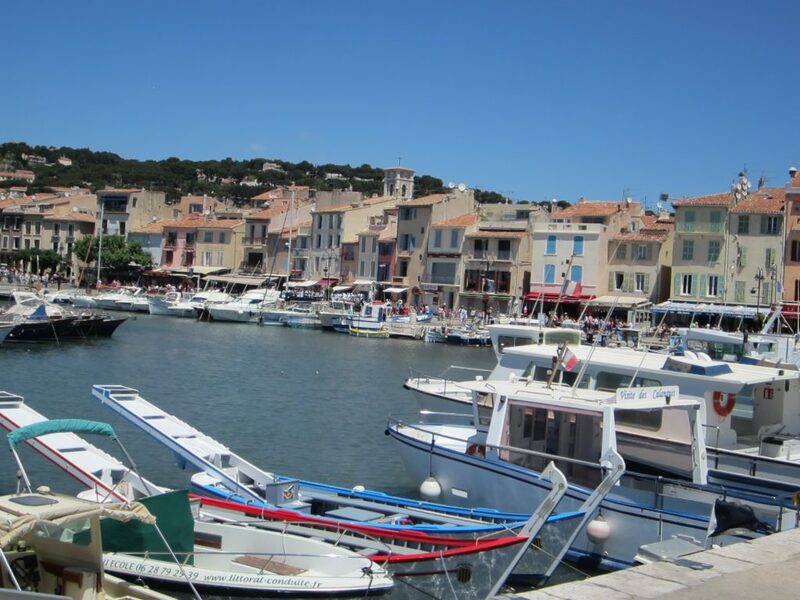 We laughed, ate and drank our way to the end of our time in Cassis at Il Ristorante du Bonheur a Croquer and lunch wound to a close. 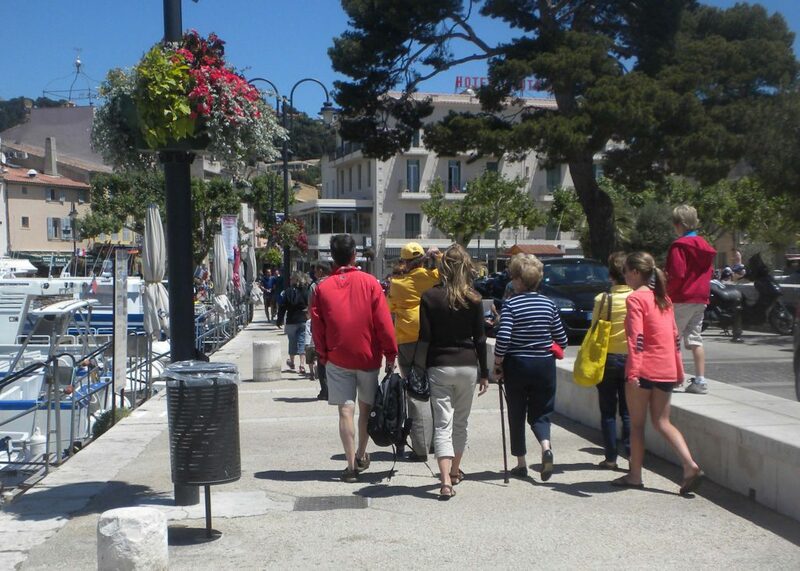 In the end, we were all reluctant to push our chairs away from the table and only the lure of other Provençal adventures forced us to stir. The general feeling of languor we all felt was not so much the result of too much food but rather a hesitancy to end a meal that was not only memorable but a poignant family experience, as well. One that, more than likely, would never be replicated for inevitably, no matter how one might attempt to recreate all of the wonderful details, somehow the next experience always differs and sadly, is never the same the second time around. Wonderful! But I don’t need “years” to appreciate these words. Now is good! Not only did you bring every memory of that lunch back into my head but reading your words gave me a bonus. I swear you pulled some mysterious cerebral trigger in my brain that also released the nascent, lingering aromas that went with those pizzas, pastas, calamaris and vinos. Forever imprinted on my memory . . . . L.